Gave Elle a second go last weekend; Elle didnt spawn on the first attempt - an overnight stint in a show vat. So, this time I wanted to set her up in a system where I could leave her for a few days with the 2 males - and with a busy schedule, I needed a low maintenance set up. So, I set her up in the tea cup tank which is connected to my males tank system - this is the same tank my shiro spawned in a few weeks ago. The males system is unheated, and I introduced aquarium heaters (quite a few), plus my drop in 3kw heater into the filtration to warm the water up to the early 20's. The water was up to 21 C over the first night, then to 24 C on the second night. Nothing on night 1. Nothing on night 2, and Nothing on night 3. Day 4 was Monday, and I needed to call time on it because I have parasite issues developing in the females tank and needed to get the fish back into their tanks before going through a treatment cycle. I got home from work on Monday night, just before dark - and went to move the fish back to their ponds. Pushing the spawning ropes to one side to reach into the tank with the pan net and we spotted eggs on the ropes! Quite a few.. The tank was covered, and I'd left small gaps in the cover to peer in and check on progress. Turns out, she laid her eggs on spawning ropes that were not visible from those observation points. The question then is, which night did she spawn? I may never know, but I suspect night 2 as I noted some (but not much) froth on the water surface at the start of day 3. The eggs looked more like eggs that have been in situ for a day than freshly laid eggs and that supported the view that they were probably laid at least 24 hrs before we took the fish out. Lots must have been eaten, but there were still quite a few left and thankfully, Elle seems to be ofay with laying eggs on the spawning ropes in nice neat patterns. Seems some females are better at it than others. 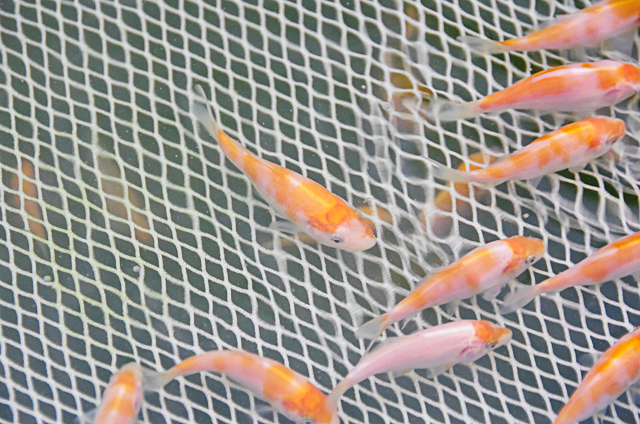 We moved the eggs into the fry pond, within the protection of a cage net - this is something I'm testing in the second half of the season, as I look for ways of making the spawning and rearing process more efficient - and ideally, more effective too. I'll have a look later today to see if we have hatchlings. Shiro pond is not looking good at all. Its little surprise considering the state of the pond when I introduced the hatchlings. I really needed hatchlings several weeks earlier, timed for when the pond was at the right stage to receive them - but those spawnings I ran in mid July didnt work out. Exhibiting at the EoE show mid July was a distraction - both in terms of the prep for the show, and dealing with the fish recovery post show - and I need to re-think the number of shows I exhibit at next year, and find ones where the timing of the show is more in line with key points in my breeding project. 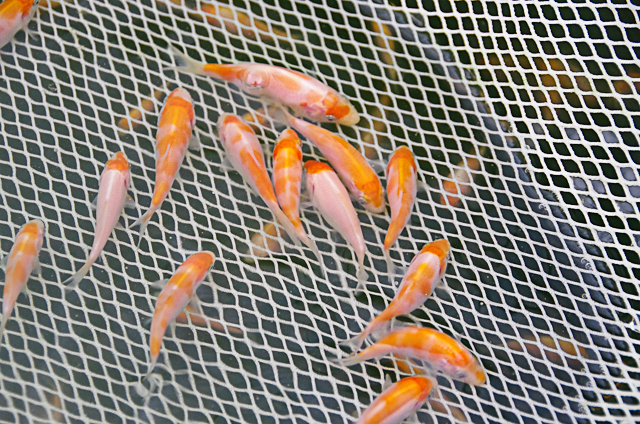 So when I started with the backup plans, like spawning the shiro female for the second time this season - the fry pond outside was over mature; it was teeming with daphnia and lots of other similar sized bugs when I put the fry in. I've learned to recognise the cyclops and unfortunately lots of those were present and they predate on very young fry. 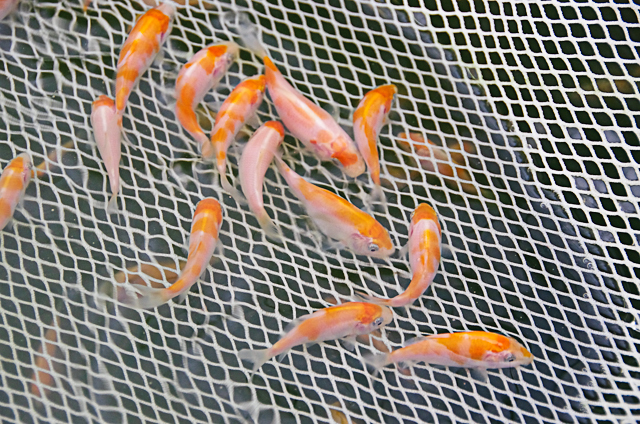 They fry were destined to struggle, outcompeted by pond life - but the only other choice at the time was to ditch the hatchlings, and I chose to give them a chance in what was a hostile environment. So I guess it's good news that there are survivors. Time will tell how many. The other tough news is that the other fry pond is also over mature now - this is the pond where I'm rearing Elle's eggs. So they're also likely to have a difficult start... , if we get any hatchlings. At this stage of the season, there are no other options - and it's worth a shot. 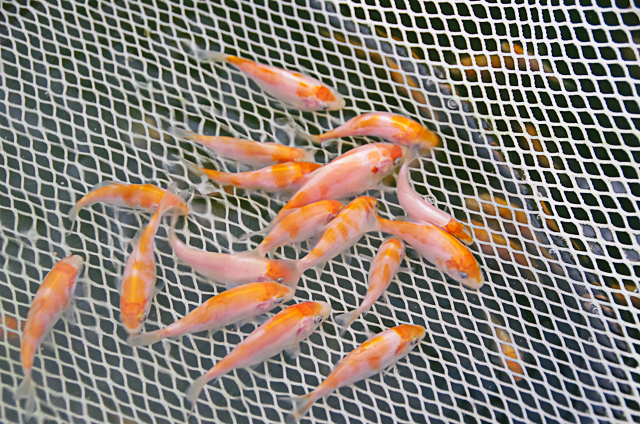 It feels like last year - I struggled to get hatchlings from the spawnings, but when I did and put them outside - the fry ponds delivered a good yield. 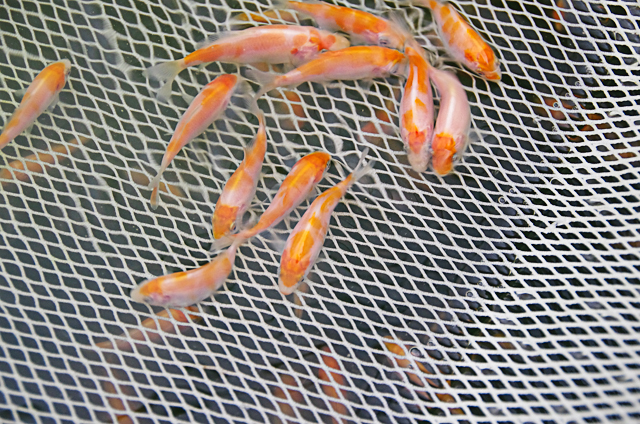 This year, I've get the spawnings running much better and have produced more hatchlings - but the fry ponds havent worked except for the one big success with the May 15 kohaku spawning. 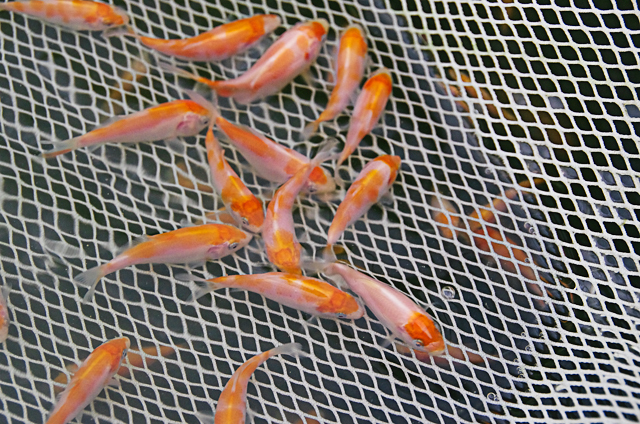 There are some lessons from this year in terms of cycling the fry ponds outside, and I've some ideas about how I can give myself more time with the hatchlings inside, should a pond outside not be ready to receive them. But - and this is a big but - my time is so limited for the hobby that I may not be able to take on these additional tasks, so for now, it's just a case of trying to time it as well as I can and then let nature take it's cours. Back to the shiro pond.... I spotted the odd fry-so some have survived but I'm not expecting much from the pond. The fry I spotted have grown a bit which is good. the plan is now to leave the pond and try not to look at it for a few weeks. There's so much bug life in there that if any hatchlings develop into fry large enough to eat daphnia - it will be like an all you can eat buffet for the foreseeable future. Sharkey has also spawned, but I didnt get many eggs and not planning to raise those other than a few in a test vat. It was the second time for her this season, and that's two females now that I've spawned successfully and attained hatchlings from, twice in one season. 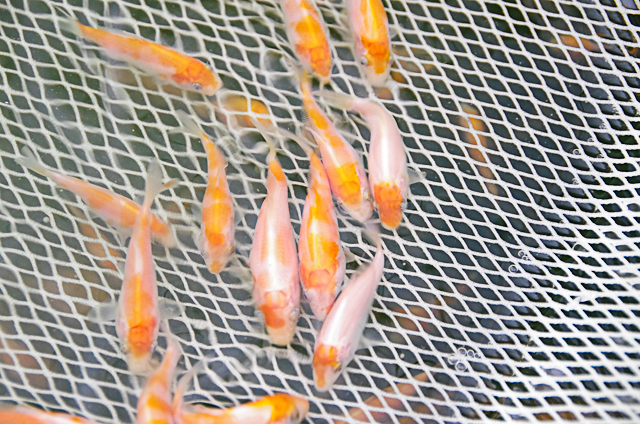 Ok, now to the second selection of the May 15 kohaku. I've finally got through the poor water conditions, stabalised the tank and the fry have started to grow and show that nice alert, and enthusiastic behaviour at feeding times that you'd expect. I reflected with Amanda that we're about 5 to 10 cm of growth down compared to this time last year! A massive amount I know, and this is partly due to the May spawning being a few weeks later than the May spawning last year; cool temps this may compared to last year, so it took 6/7 weeks instead of 4 weeks to get to 1st selection size. And then with the tank troubles, we think we've lost at least 1 month of growing on time - probably more like 6 weeks. In once sense, I'm not too worried. I proved last year that I can grow home bred tosai to 40cm by spring and I found in the shows this year that size 2 is a sweet spot and that's up to 35cm - so I don't need 40cm tosai! An average 30-35cm by spring would be fine. That said - I cant afford too many more problems in the growing on system. Size wise, the fish are averaging 2 inches - some are already 3inches +, and others are not much past first selection size (!) at just over an inch. Keeper ratio's are well down on last year, and this is best demonstrated by the thousand I didnt have time to perform first selection on, and grew on in the green vortex tank straight to second selection. I went through those the other week and kept around 50. So, a 5% keeper rate. Last year, it was 25%! Out of the 3k fry that we kept from first selection, we've kept around 500. And I was fairly relaxed in the selection criteria. 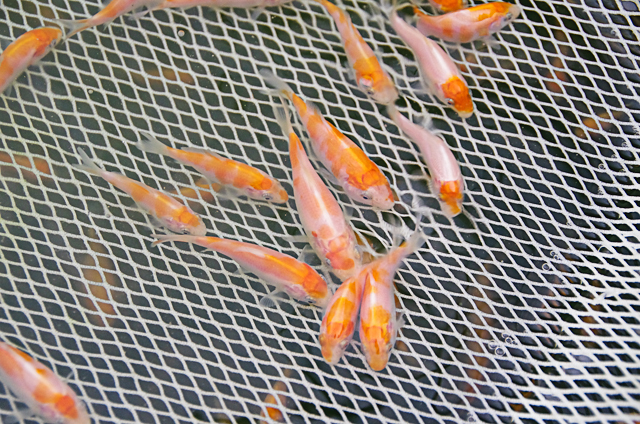 I'm conscious that it's early days with these fry, and when I look at the top 30 from last year's spawnings and consider what they looked like at this point last year - some I could spot at second selection time, but many others I couldn't. So, with enough tank space to grow on 500, the level we selected to turned out just about right. The plan now is to take these on to around 10cm-15cm. 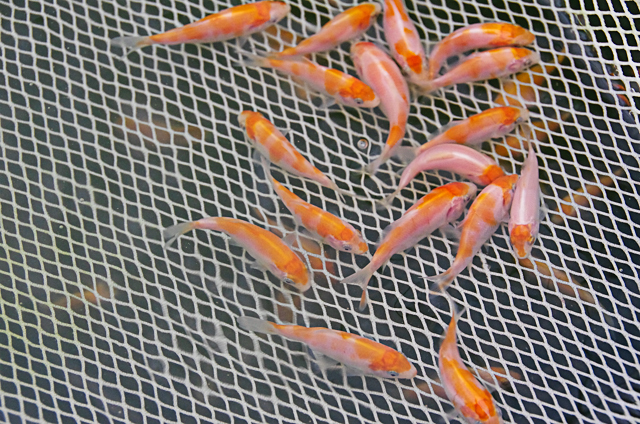 3k kohaku fry ready for second selection. Keepers to the right, ones we select out to the left. 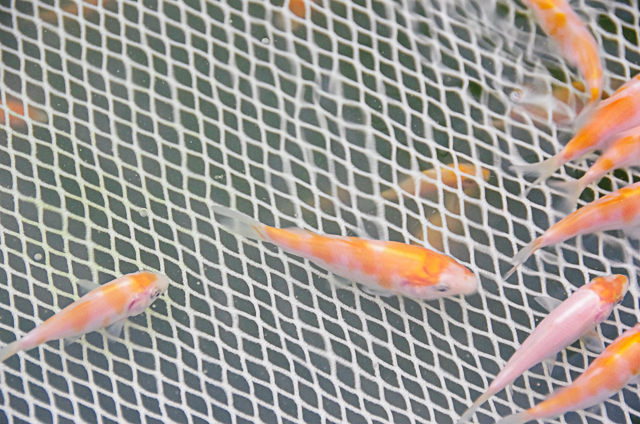 Elle's eggs being reared in the protection of a cage net within the fry pond outside. Some pics of a few of the keepers from yesterday's second selection; at this point, and picking up on something positive... I'm happy we have a decent number where a much of the pattern lies above the lateral line. Keepers in the section of the net at the bottom of the pic. Middle section housed the fry before selection - and now empty. The top section; Amanda's double checking for any good ones that we might have missed. Having another tough year on the spawning side has made us even more appreciative of the tosai we have from last year. These are approaching nissai now, and to be honest, we intended to sell at least half of them as we simply don't have space for them all. This summer, they've been spread across the males and females systems. And there are probably 10 - 15 or so sitting in one of the growing on tanks. With time being in such short supply, we simply havent been able to fit in the ebay lay up time for these fish. There's a chance one of my growing on tanks will be free over the winter, so we may chose to use that to grow on a select few nissai. But I still have to shift at least 15 of last year's fish and appologies for our slow response to those people who've been asking about picking up one of our 2014 tosai... With the breeding season coming to a close, we'll have a bit more time to sort out moving those fish on. How do you acclimatise the eggs to go outside so quickly? I had assumed they would be too fragile to go through such a major transition from indoor heated to outdoors. Hi. The temperature difference wasn't too great that day so I just moved them. If the temp difference is more than a few degrees then I adjust the temp indoors to match. It's a juggling act because the temp of the water outdoors can change quickly depending on how much sun we get. And the same goes for indoors.